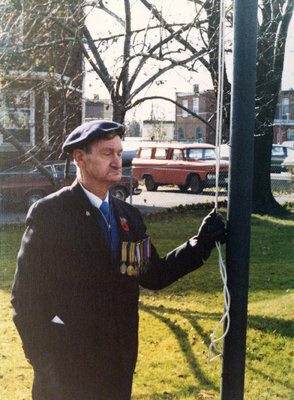 A colour photograph of Retired Sergeant James Wilde at the flag pole at the Whitby cenotaph. Mr. James (Jim) Wilde (1899-1984) was a veteran of the First and Second World Wars serving in France from 1916 to 1919 and England and France from 1941 to 1945. He was one of the founding members of the Royal Canadian Legion Branch 112. Whitby Cenotaph, 1976, Robert Kirk. Whitby Archives D2013_005_013.